Happy President’s Day! It’s not the most glamorous of holidays, but that doesn’t mean Hollywood has ignored it. To the contrary, there are dozens of movies you could watch to celebrate. Like Independence Day. Or, you could watch some films worth seeing. Like these five. Enjoy! 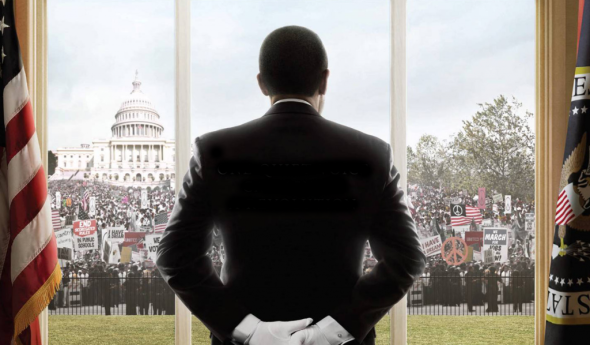 Lee Daniels’s well-stocked cast populates a yarn about a White House butler (Forest Whitaker) who watched his father shot to death in a cotton field and witnessed 8 different presidents and the social upheaval of 8 administrations before finally casting a ballot for his country’s first black president. Equal parts sentimental and subversive, the film is more sly than a casual observer might realize, full of the tricks of any Big Hollywood Epic as well as cagey casting. This is a sly directorial feat that made salient points and still grossed more than $100 million. Quote: We have no tolerance for politics in the White House. Yes, it’s long and it takes some historical liberties, but this film adaptation of the hit musical makes the genesis of the America revolution almost as much fun as that episode of Schoolhouse Rock that had you singing the preamble. Quote: I have come to the conclusion that one useless man is called a disgrace, that two are called a law firm, and that three or more become a Congress! Robert Redford and Dustin Hoffman play the great onscreen odd couple investigative reporters Bob Woodward and Carl Bernstein, the Washington Post writers who sleuthed out the truth behind the definitive act of Presidential corruption. Winner of four Oscars, including recognition for William Goldman’s meticulous screenplay, the film remains a staple of both political cinema and the great American filmmaking of the Seventies. Quote: Nothing’s riding on this except the, uh, first amendment to the Constitution, freedom of the press, and maybe the future of the country. Ron Howard turned away from the heavy-handed sentimentality that marred his entire career to direct a pointed yet textured account of the TV interviews that finally got the American public the Nixon confession they desperately needed. The effort is aided by outstanding performances from Frank Langella and Michael Sheen. Quote: I’m saying that when the President does it, it’s not illegal. Spielberg ladles on the nostalgia and sentimentality in the first and final scenes, but in between is about two and a half hours of brilliant filmmaking and even better acting. Daniel Day-Lewis is as good as all the hype, and his supporting players are also magnificent. The amazing thing that can go overlooked is how gloriously Tony Kushner unveils modern politics by articulating the struggles of the past. Quote: Euclid’s first common notion is this: Things which are equal to the same things are equal to each other. That’s a rule of mathematical reasoning and its true because it works – has done and always will do.